Founded in early 1999, Victorian Plumbing is a major online bathroom retailer based in Merseyside, UK. It’s now established as one of the largest retailers of branded and in-house designed bathrooms and accessories, offering an extensive range of modern and traditional bathroom products online. Whatever the channel, the brand is intent on providing the best possible shopping experience, throughout each stage; from browsing and ordering, to receiving your goods, with the goal of making its online journey as easy as possible. To win new online customers in a competitive market, it began using a number of conversion optimisation tools, to create an online experience where it is easy to find products, navigate style and colour, and to buy in as few steps as possible. The e-commerce team started talking to Taggstar in 2017, to understand how real-time social proof product messaging could boost results. As with all e-commerce sites, the online conversion story happens in a number of steps, from product page, through basket and checkout pages, with the online retailer looking to move its buyers through these micro-conversions without churn. 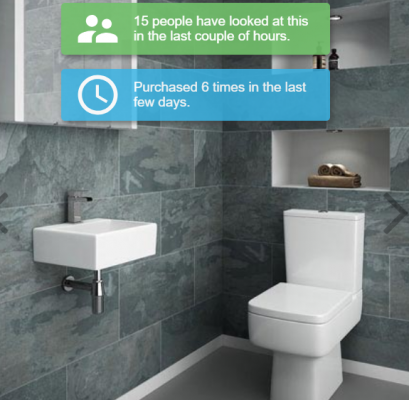 Victorian Plumbing wanted to use Taggstar’s SaaS social proof platform to create a more engaging customer experience, by using targeted, real-time messages to share rich product information. Taggstar works using crowd-sourced data that is pulled from online users’ browsing history. Taggstar’s Trend AlgorithmTM pulls aggregated data, including the number of people viewing an item, reviews and ratings, top-trending items and scarcity into on-page message balloons. The factual messages replay what other shoppers have bought or are interested in. They’re designed to help buyers to be confident in their bathroom choices, and to support retail sales buy nudging them through the buy journey. Impressed by test results, Victorian Plumbing immediately signed an ongoing agreement to deploy Taggstar throughout the entire sales funnel. It now averages close to 160,000 daily API requests – that’s 30m API requests since full deployment. It has full control of its social proof experiments, and can customise message content, tone of voice, colour and on-page position to increase engagement. Victorian Plumbing saw impressive engagement and significant conversion rate uplift from its first tests. Its test group covered 50% of its online customers. 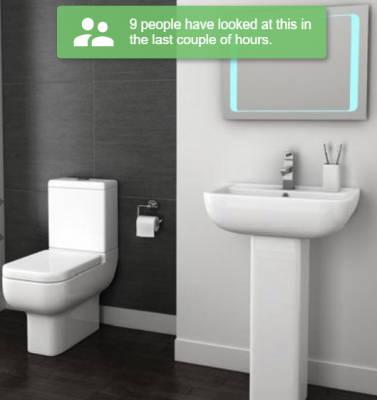 In the six months after putting Taggstar in place, Victorian Plumbing has been able to measure an average conversion rate uplift of 2.41% and can track sales of more than £159,000 from the first 30 days alone, directly-linked to purchases by bathroom buyers who’d seen the social proof messages.